We're delighted to announce the publication of the latest in our series of Green Economy Barometers - this time covering the Eastern Caribbean region. The Eastern Caribbean Barometer was produced in collaboration with the Caribbean Natural Resources Institute (CANARI), a leading regional NGO with more than 25 years experience of policy analysis in the Caribbean. It rates the the transition to a truly green and fair economy in the Eastern Caribbean as below average, and argues governments' narrow focus on GDP has failed the members of the Organisation of Eastern Caribbean States (OECS). In the Caribbean, a Green-Blue economy is one which creates better well-being and social equity, while at the same time reducing environmental risks and ecological scarcities. So, it is a means to creating a resilient economy which provides a better quality of life within established ecological limits. The study notes that there is already consensus that a new approach is needed to redress the creeping environmental degradation, general economic and social malaise in the OECS and the high vulnerabilities to natural hazards revealed by the monster 2017 hurricanes. It suggests opportunities to build on “green shoots” of positive initiatives in the OECS by: including the value of nature in national economic decision-making; greening key sectors, including energy, tourism and agriculture; enhancing support to micro, small and medium enterprises (MSMEs) to provide economic opportunities, including for poor and vulnerable groups; reforming fiscal policy to support a new approach to development; and mobilising public and private financing. 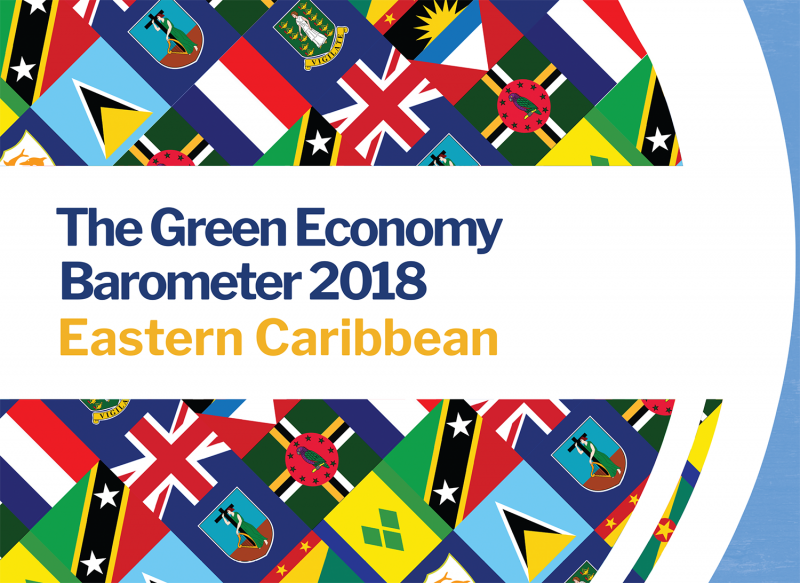 The Eastern Caribbean Green Economy Barometer 2018 is now being distributed to regional stakeholders to contribute to enhancing understanding on potential pathways for economic transformation and catalysing action through change in policy and practice. The Barometer is being shared at the Caribbean Development Bank’s Blue Economy Caribbean Conference being held in Miami on November 6, which will examine opportunities for financing this economic transformation.